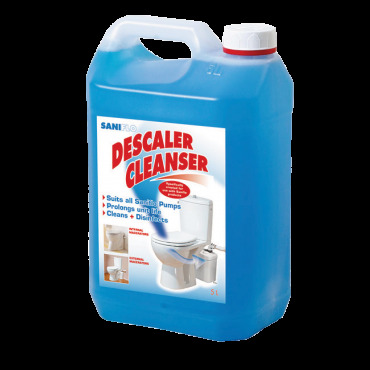 The Sanigrind Pro is the best solution to install a full bathroom in demanding situations using any conventional toilet. 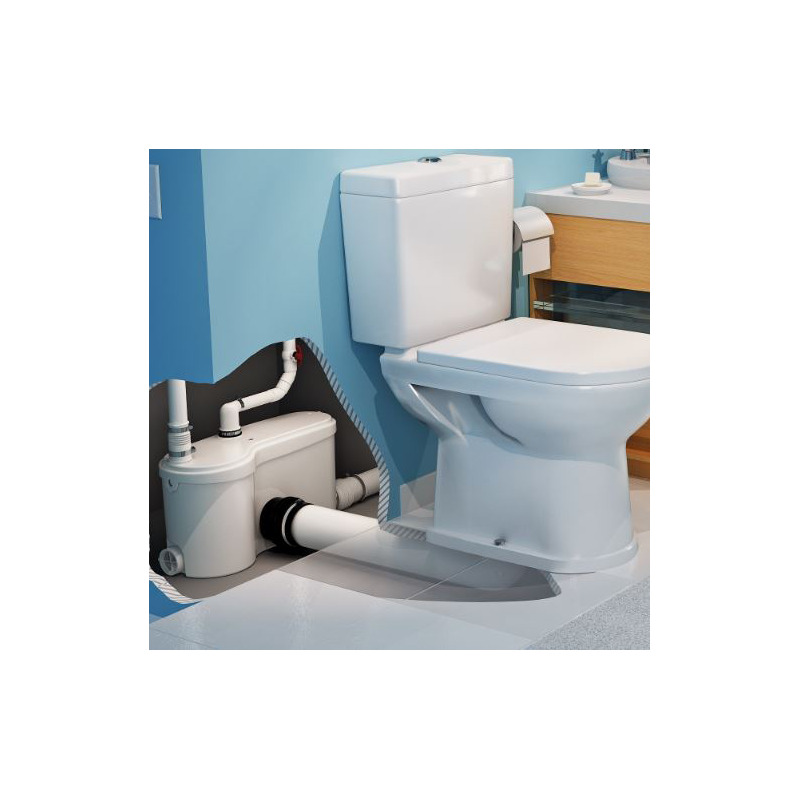 The Sanigrind Pro is a 1 HP pump system used to install a complete bathroom up to 25 feet below the sewer line, or even up to 150 feet away from a soil stack. It incorporates a grinder system which is ideal for uncontrolled environments in both residential and commercial applications (ie. rental unit, offices, warehouses, etc). The Sanigrind Pro is designed to handle sanitary products that may have been flushed down the toilet; such may consist of condoms, sanitary napkins, q-tips, dental floss, etc. 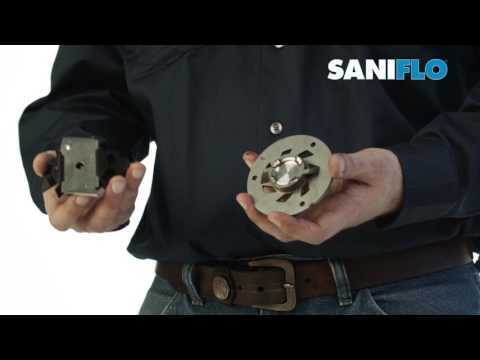 The inside of the Sanigrind Pro comprises of a pressure chamber, which starts and stops the unit, and the motor, which drives the stainless steel cutting blade and the pump. When the flush is activated, the water flowing into the Sanigrind Pro activates a micro switch in the pressure chamber, which in turn starts the motor. The motor is sealed for life in an oil filled enclosure. A common spindle/shaft drives the impeller and the blades. 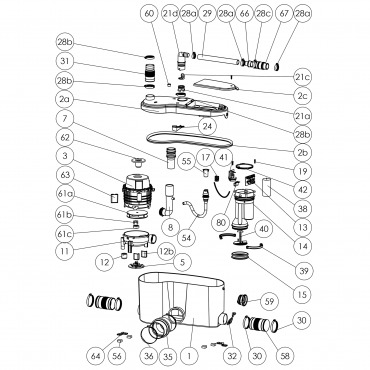 The moving parts therefore are kept to an absolute minimum. Water and organic waste matter, enter the chamber and are reduced to slurry as the blades rotate at 3600 RPM. The reduced solids are picked up at the bottom and the impeller mounted beneath the motor ejects the waste. The unit pumps the effluent upward to 25 feet and/or 150 feet horizontally (with gravity fall). 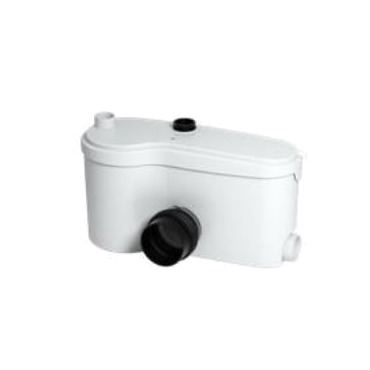 Once the water level in the container goes down, the micro switch deactivates. 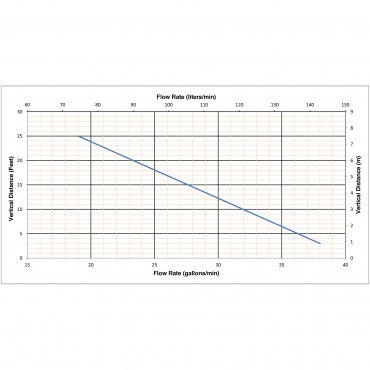 The operating cycle for the Sanigrind Pro varies depending upon the discharge pipe run configuration. In addition, the Sanigrind Pro will also discharge gray water from a variety of other sanitary fixtures such as: a sink, a bathtub/shower, a urinal and even a washing machine (indirect connection). When adding a bathtub/shower, there should be a height difference between the base of the pump and the base of the bathtub or shower. 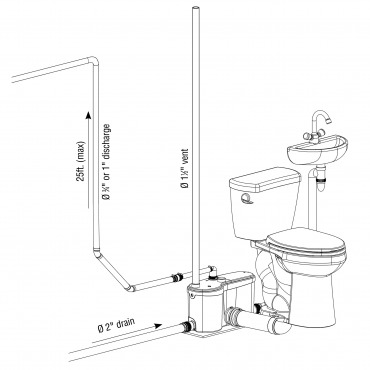 This height difference should be of 8”, to allow for the installation of a P-trap and the required 1/4” per foot gravity flow towards the pump unit. The wastewater from other sanitary fixtures is discharged into the Sanigrind Pro via two 2-inch inlets, on either side of the housing. The discharge elbow on top of the Sanigrind Pro can be rotated 360 degrees depending on the discharge installation. 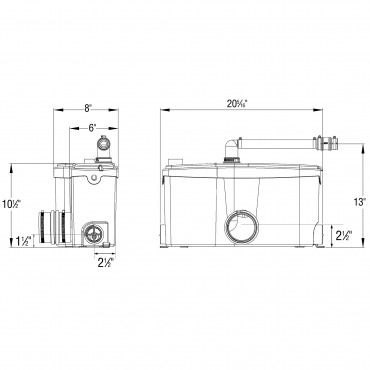 A non-return valve (included in assembly) prevents back flow into the unit. 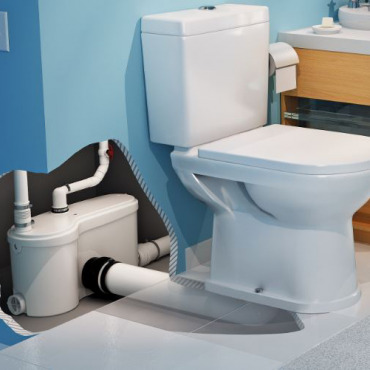 Periodic maintenance can be accomplished easily without having to disconnect the unit from either the toilet or the rest of the plumbing system. Through a service panel, a service contractor can easily access the electrical components as well as the level sensor mechanism of the pump. 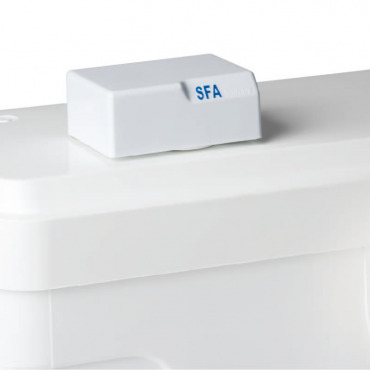 The Sanigrind Pro unit must be connected to a standard conventional toilet with a bottom outlet. The maximum distance from a toilet should be no more than 36 inches and should have enough gravity fall. The Sanigrind Pro has been certified to American and Canadian Standards. Macerating standard; US: CSA Certified & IAPMO (UPC) listed - ASME A112.3.4, CA: Macerating Standard CSA B45.9. The Sanigrind Pro (014) is ordered as a single unit only. No toilet, cabinets, shower nor bathtub are included.